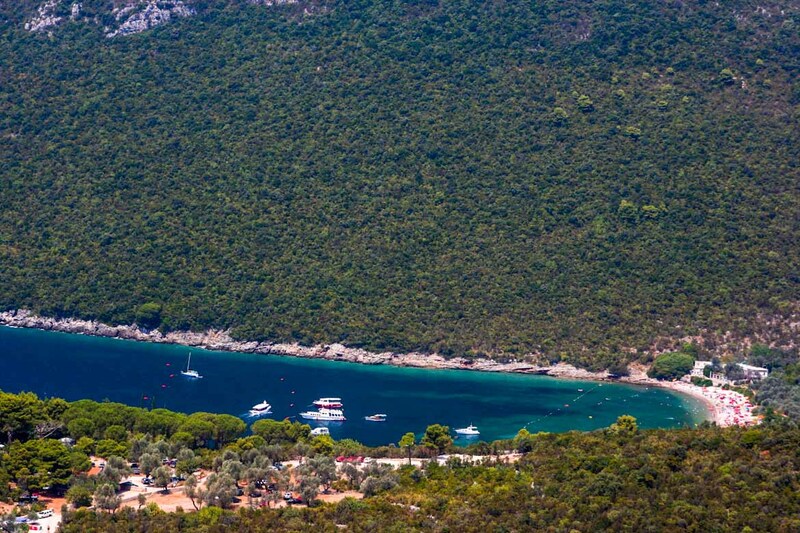 Herceg Novi riviera is 25 kilometer long, and includes peninsulas, small islands, beaches of different profiles and attractive resorts, with deep mountainous background and picturesque villages and settlements situated among the olive groves and other exotic Mediterranean vegetation. Zanjic is situated in the Miriste valley, deeply pulled in the dry land of the Lustica peninsula, 3.8 miles away from Herceg Novi. It is surrounded by old olive groves and azure sea water. The beach is covered with white pebbles. It is 300 meter long, 15 meter wide and its capacity is 1000 people. The background of Zanjic is the olive grove where you can find a shade, drink wine or enjoy the specialties of Lustica. Nearby, there are the Blue Cave and the Isle of Mamula with an old Austrian fortress. You can come to them by private boats or as a part of the tour organized by a travel agency. However, the Zanjic beach can be accessed both from the sea and dry land. Best accommodation in the vicinity of the Zanjic plaža beach. Hotel Art Media – This property is 3 minutes walk from the Zanjic beach. And just 30 meter from a rocky beach on Luštice Peninsula, Apartments Art Media offers bright and elegantly decorated interiors equipped with free Wi-Fi, air conditioning and flat-screen satellite TVs. The property includes a restaurant serving Mediterranean food, including vegetarian meals. Various art programmes are occasionally organised at the Art Media. They include theatre workshops, yoga and live music events. Art Media includes suites and junior suites with private bathrooms and seating areas. They all have kitchen facilities, but cooking is not allowed in the accommodation units. Facilities : Garden, Massage (Additional charge), Bikes available (free), Canoeing (Additional charge), Restaurant (à la carte), Free-Wifi, Bar, Shuttle service (additional charge), Ironing service (additional charge), Laundry (additional charge), Private parking (2 euro a day), Safety deposit box, Mosquito net. There is Miriste valley between Zanjic valley and Miriste cape. 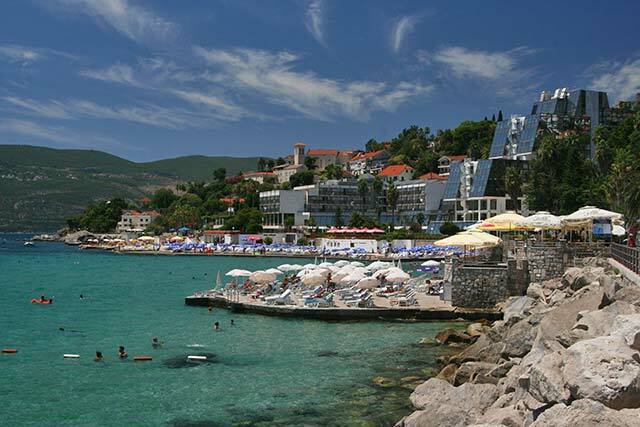 It is the most attractive location of Herceg Novi Riviera. The modern bathing beach called Masline has been built in the valley, as a combination of concrete and sand. The beach is separated from the dense olive forest in the shape of steps, and forms a unique harmony with the sea, the harmony which can be created only by nature. As a part of the bathing beach is a restaurant where you can taste the specialties of this place. Best accommodation in the vicinity of the Mirista plaža beach. Apartments Bellavista – This property is 3 minutes walk from the beach. Situated in Luštica, Apartments Bellavista offers accommodation with free WiFi and air conditioning. Guests can relax at the common terrace featuring sea views. Featuring a kitchenette with a stovetop and a kettle, apartments also include a dining area. There is a seating area with a TV. Private bathrooms come with a shower. For your comfort, towels and bed linen are provided. 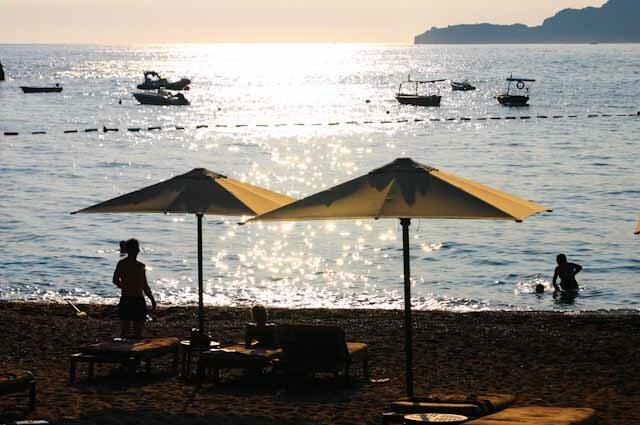 Mirista Beach is 350 meter away while Zanjice Beach is within a 10-minute walk. The property is at a distance of 1 kilometer from the Arza Beach. Facilities : Terrace, Free-WiFi, Swimming pool, Grocery deliveries (Additional charge). Rose is a fishing settlement with the unique architecture, sticked to the sea and leaning on a hill, at the very tip of the Lustica peninsula, facing Igalo. This is one of the most beautiful spots of the Riviera. It’s background is a forest with extraordinary samples of Mediterranean horticulture. The beach is rocky, and the sea is deep with sandy and rocky bottom which is a true challenge for divers and underwater fishing lovers. This place used to be a quarantine for the seamen from all over the world. Nowadays the successors of Portuguese and Spanish sailors can be met here. You can reach Rose both from the sea and dry land. Best accommodation in the vicinity of the Rose plaža beach. Apartments Barizon – Apartments Barizon is an apartment with a private beach and free WiFi. All accommodation at the apartment comes with a flat-screen TV with cable channels, a private bathroom and a fully equipped kitchen. Each accommodation has a terrace with sea views. Apartments Barizon also includes a barbecue. Bike rentals are available at the property and snorkelling is possible nearby. Facilities : Free Wi-Fi Internet Access Included, Picnic Area, Outdoor furniture, Private Beach Area, Terrace, Garden, BBQ Facilities, Diving (surcharge), Canoeing (surcharge), Grocery deliveries, Airport Shuttle, Ironing Service, Laundry. Igalo encompasses the coast line from the Sutorina river to the Galeb restaurant. This is a bathing beach and a promenade at the same time. A part of the beach is sandy, and the other one is concrete what provides pleasant bathing. For those who like bathing beaches that are part of the hotel, Igalo is an excellent choice. There are many restaurants and cafes which lure with the smell of fish specialties, the sound of good music and pleasant environment. As there are many gorgeous and well dressed girls a lot of people call this beach “the longest catwalk” on the Adriatic coast. The beach is 1500 meter long and it’s capacity is 3500 people. Best accommodation in the vicinity of the Igalo plaža beach. Durakovic apartments – This property is 16 minutes walk from the beach. Located in Igalo near Herceg-Novi, Durakovic Apartments features air-conditioned accommodation with sea views. Free WiFi is available in all areas and free private parking is provided on-site. All apartments are fitted with cable TV, a kitchen with a dining area, and a private bathroom. A patio or a balcony with mountain views are offered in all units. Private bathrooms comprise a shower and free toiletries. Some units also come with a washing machine. Durakovic Apartments also provides barbecue facilities and a dining area in the garden. Facilities : Free-Wifi, Free parking, Outdoor fireplace, BBQ facilities, Balcony, Kitchen, Washing Machine, Refrigerator, Kitchenware, Private entrance, Tea/Coffee Maker, Sea view, Air conditioning, Airport shuttle (additional charge). This part of Herceg Novi riviera is decorated with numerous small beaches, pontoons, and small quays with orange, tangerine and olive groves and other Mediterranean vegetation in their background. Almost all of these beaches are in private property, so if you happen to be here you can sunbathe and swim as if on your own beach. The length of this part of the coast is about 3100 meter, and its capacity is about 6000 people.